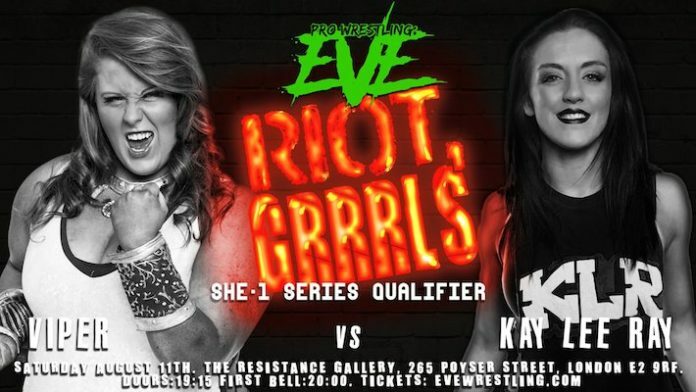 Pro Wrestling: EVE will be holding their ‘Riot Grrrls’ event this Saturday from the Resistance Gallery in London, England. One of the marquee bouts of the night will see the newly crowned World of Sport/WoS Women’s Champion Kay Lee Ray face Viper. This match will be a qualifier for the upcoming SHE-1 tournament, last year’s SHE-1 saw Charlie Morgan earn an EVE Title shot at the Wrestle Queendom event earlier this year, she went on to win the Championship after defeating Sammi Jayne in the main event of the evening. Fans of WoS will notice that this is essentially a rematch from this past Saturday’s show, Kay Lee Ray became the first ever Women’s champion after defeating Viper in a Triple Threat match which included Bea Priestley. KLR and Viper are both world renowned performers having appeared in Japan’s Stardom promotion, ICW and the inaugural Mae Young Classic for WWE. Opinion: If you have never seen these two stars perform in an EVE ring and you live near London then this is an opportunity that you cannot miss. Pro Wrestling: EVE is one of the big reasons that Women’s wrestling has seen a resurgence not just in the UK but globally. If you can’t make the show then check out EVE’s On Demand service for all of the action. Congratulations to @Kay_Lee_Ray , @missviper91 and @BeaPriestley who today rightfully main evented the @WOSWrestling TV show on @ITV today.